Grade Level: Program is for 3rd-High School, This DVD is for the Teacher. 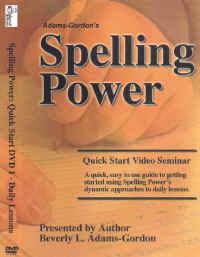 This DVD Training Video works with either the 3rd Edition or the 10th Anniversary Edition of Spelling Power. You can purchase the Teacher Resource CD for only $4.95 (no extra postage charged on this item)!